The Daily Flos: Can You Dig It? 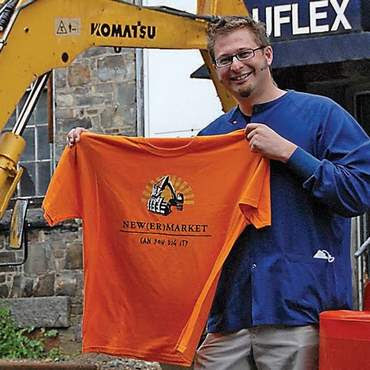 "NEWMARKET — Backhoes and the color bright, construction orange are familiar sights downtown. They are also the part of a new T-shirt to help businesses during this year’s downtown reconstruction. Local organizations looking for ways to encourage people to shop at downtown businesses during construction were the inspiration for the T-shirts, which were designed by Nathan and Rachel Swanson of Newmarket Dental. Nathan Swanson is on the Board of Directors of the Newmarket Business Association (NBA). "We were looking for ways to promote the idea that during construction, Newmarket is still open for business. The economy is certainly struggling and given people are detouring (through town) it’s potentially harmful to a lot of the small businesses … the big take-home message is to encourage people to shop in Newmarket," Nathan Swanson said. Proceeds from the T-shirts go to "We Dig Newmarket," a collaborative effort to help encourage people to do business downtown. The initiative offers Saturday music serenades from 11:30 a.m. to 2:30 p.m. The group has also installed signs along Spring Street pointing people to access points for local businesses, said NBA President Gerry O’Connell." Blog more!! More!! I love you. I love your posts! Please keep them coming.